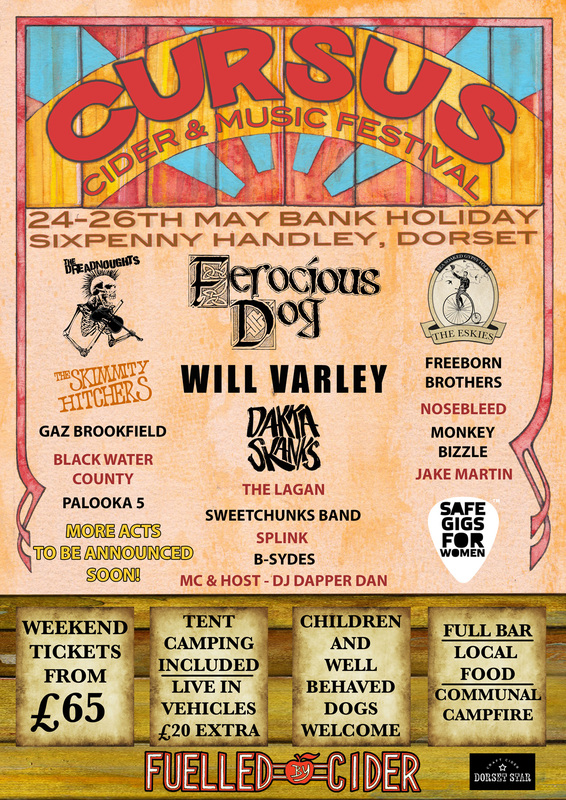 Cursus Cider & Music Festival V takes place on Bank Holiday Weekend May 24th – 26th 2019. We has such a blast at the first four Cursus Cider & Music festivals we are doing it again in 2019. Expect a similar line up and vibe – Just good people, good music and tasty food & drink. Friday we’ll be open from 12pm again with the live music starting at 6.30pm and on Saturday and Sunday we will have a full program of music from 1pm. As with previous years Friday is an optional extra and the add-on for Friday is cheaper than a standard day ticket. New for 2019 – No booking fees and your first pint/half pint cup is Free! All tickets include tent camping, day ticket campers must vacate the site by 12pm the next day. All other campers must vacate the site by 12pm Monday. Super Early Bird Saturday & Sunday – £45 – 2018 attendees only. Early Bird Saturday & Sunday – £55 – SOLD OUT!! Standard Saturday & Sunday – £65 – On Sale Now!